So you will see that some wired microphones require a battery pack and others have to rely on the virtual power supply on the mixer so if you buy a condenser microphone, remember to check if your mixer is supported it. Often recording studios tend to use condenser microphones for radio reception because of their high sensitivity and generally better dynamic and frequency response than moving coils. However, if the studio soundproofing is not good enough, you will find that Condenser microphone instead is a bother. Condenser microphone outperforms moving-coil microphones in terms of sensitivity and extended high-frequency (and sometimes low-frequency) response. This is related to the working principle that the condenser microphone needs to convert a sound signal into a current first. In general, condenser microphones are very thin and easily vibrated by sound pressure, causing a corresponding change in voltage between diaphragm and diaphragm back panel. And this voltage change will be followed by preamplifier multiples of amplification, and then converted into sound signal output. 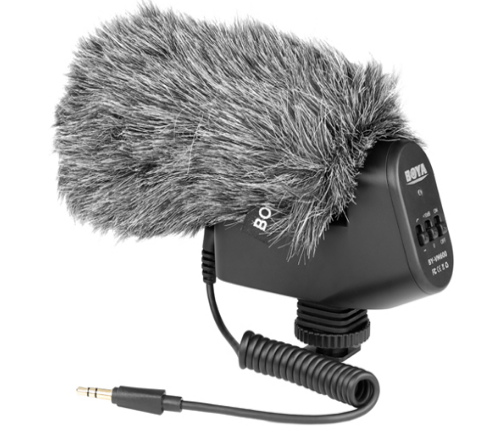 The BOYA BY-VM600 is a new designed directional shotgun microphone which can maximizes the sound quality. The "preamplifier" used here refers to an amplifier built into a microphone, not what we commonly refer to as "pre-amp", the preamplifier that comes with the console or interface. Due to the very small area of ​​the condenser microphone diaphragm, its response to low-frequency or high-frequency sound signals is very sensitive. Most condenser microphone are capable of accurately capturing the sound signals that many people can not hear at all. In contrast, moving coil microphone works much simpler. It produces sound signals primarily through the movement of conductors in a magnetic field. In fact, the dynamic microphone microphone sound signal generated, mainly through the coil is closely connected to the wire coil according to changes in sound pressure in the magnetic field to complete the movement. Due to the relatively large volume of the moving part, the dynamic microphone is inferior to the condenser microphone in response to the frequency range (mainly the high frequency part), sensitivity and instantaneous response capability.